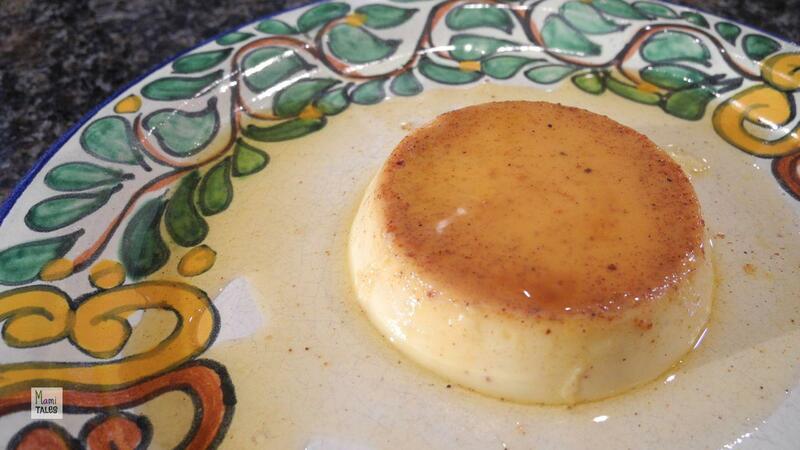 A velvety textured flan made with cream cheese and Rompope (a Mexican rummy eggnog). Melt the 1/2 cup of sugar mixed with the 3 TBS of water in a small pot under medium-high heat, stirring occasionally. Once the mixture turns light amber, remove from the stove and pour on the baking pan where you'll make the flan, swirling the caramel to cover the bottom of the pan. Set aside. Preheat the oven at 350˚F, with the rack in the middle of the oven. Mix in a blender of food processor the Rompope Coronado, evaporated milk, condensed sweetened milk, cream cheese, vanilla, nutmeg and cinnamon. Blend until all ingredients are well incorporated. With the blender off, add the 3 eggs and blend at low speed. Pour the mixture from the blender into the prepared baking pan, making sure you don't fill it more than 2/3, and seal the pan with aluminum foil. Place the prepared baking pan into a larger pan to cook the flan in Bain Marie. Pour boiling water in the larger pan, covering the smaller pan with the flan half way. Place the Bain Marie into the oven and bake between 1 hr and 1 1/2 hrs, until the blade of a sharp knife or cake tester comes out clean after inserting it in the middle of the flan. Take the flan out and let it cool off. Once it is cold enough loosen the flan by running the blade of a knife all around the baking pan. Place serving dish on top of the pan and turn over, letting the caramel flow down the sides of the flan. Let it cool in the refrigerator for about and hour and enjoy! I once made this flan with just 2 eggs, left it for an extra 40 minutes in the oven, and it did set. If you want to make a lower cholesterol version, that could work. Yum! Can you please post one to me too? Otilia, I wish I could mail you one 🙂 I’m afraid it wouldn’t travel too well… but if you’re ever in LA, I’d be more than happy to make one for you!